Christmas may be over, but winter sure isn’t! We’ve got a solid three months of snowy weather left around here, so I’m thinking a fun little hot chocolate party might just be in order. Or any party, really. 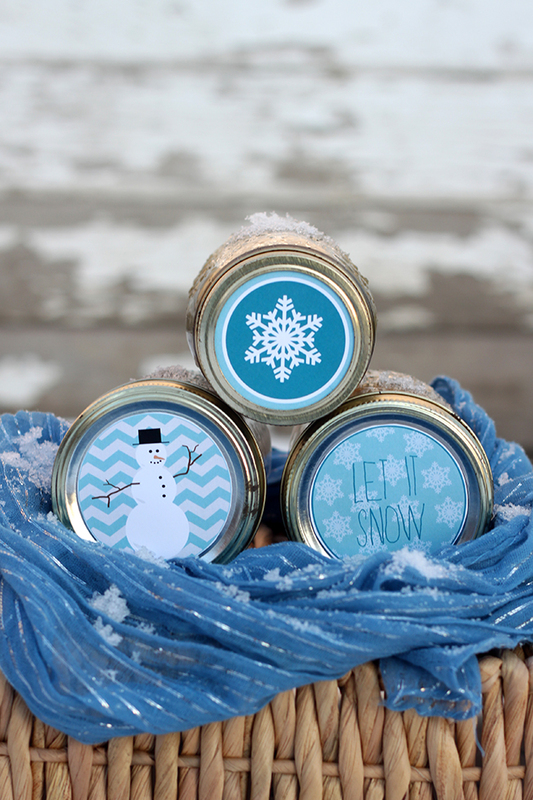 These DIY mason jar labels are the perfect touch to turn a plain old jar into something worth giving. They make a great party favor, or are a cheap way to say thanks. 1. Download the PDF file from LuckyYouPrintables here. 2. Print the document onto full sheets of 8.5×11 label paper. It also works to use card stock and tape, but label paper is easier and just looks better. Consider waterproof label paper to keep the colors from bleeding if splashed. 3. Use a circle cutter, or a 2.5-inch hole punch to cut out the labels. If you have a steady hand, you can use a pair of scissors, but again, the circle cutter just looks better. 4. Fill jars with whatever you’d like. You can use them for canned goods such as jam, salsa or applesauce, or make them into a mini hot chocolate gift. Fill with a few scoops of hot chocolate, mini marshmallows, and a couple hard peppermint candies. Really, these labels can be used for anything. 5. Fasten lids on jars, and make sure the lid surface is clean and dry. Remove the labels from the backs, and stick onto the jar lids. Depending on the jar lid size, some of the label may be covered by the lid ring. With typical wide-mouthed jars, the label will be completely visible even with the ring on. I think they look great either way. 6. For added flair, tie a ribbon or twine around the jar. 7. That’s it! Use them as party favors for holiday get-together, baby showers, birthday parties and more. They also make great cheap gifts for neighbors, teachers and co-workers. I love these labels for Mason Jars that are filled by oneself and may be used on so many occasions. Thank you so much for sharing with us.